UPDATE: Read our review of these here! Just 12 days ago, we mentioned the announcement of the Chocolate-Dipped Altoids (coming before the end of the year). Two days ago I get an email from someone saying they have some for auction on eBay. Ever the skeptic, I asked who the seller was and how they obtained them. Turns out the seller is an Altoids employee and the proceeds are going to charity (The American Red Cross – which my wife works for) so I am inclined to believe the seller. I even made the first bid on them (I’m pipa). As of this writing, the bidding is up to $172.51, which although the money is going to charity, I just don’t understand. If they were in special tins, or the tins were signed by someone famous, or the tins were numbered 001 or something, I could understand it since they might increase in value. As far as I can tell though, these are the same items that will be on store shelves by the end of the year. 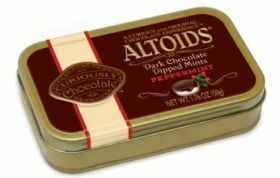 If you REALLY want to try them you could easily make your own chocolate-dipped Altoids (just without the tin). Maybe Golden Palace will buy them for a bunch of money and The Red Cross will get a ton of money from it. Mmm. Chocolate Ginger altoids sounds yummy. I love Ginger!